Why, oh WHY, didn't I read this book sooner?! I won a review copy from a Goodreads giveaway, and kind of just held onto it. Then, the next year, I won a Goodreads giveaway of book two, Phoenix, and the same deal happened. You'd think that winning those giveaways TWICE (one for each book) would have pushed me to read them... oops? Anyway, I really enjoyed this book! The power struggle between humans and Darklings, the romance between Ash and Natalie, the scheming, the secrets, the politics - this is definitely a book for me! Ash is a twin-blood (half-human, half-Darkling), but in the city, he always feels like a Darkling. Natalie is a Sentry, human, and daughter of the Emissary (someone super powerful). She feels trapped in her life, trapped into watching her mother and ex-boyfriend and ex-boyfriend's father hurt Darklings mercilessly. When Ash and Natalie meet, it isn't love at first sight - they hate each other. But they grow closer. As they grow closer, things get more dangerous for them, and in general, the city becomes more dangerous. It is clear that humans and Darklings will not live as they are (segregated), and war is coming. The beginning - really, the first half - of the book is deceptive. It would appear that the first half is all about Ash and Natalie hating/growing to like each other. The two of them did NOT hit it off at first, though there is an odd physical connection between them. Ash's best friend Beetle used to date Natalie's new best friend Day, and Day hates Ash, because she thinks Ash got Beetle hooked on Haze (think: heroine or ecstasy or something). So, Natalie doesn't like Ash. Ash definitely doesn't like Natalie - she's a Sentry. Her ex-boyfriend Sebastian is a Tracker and totally heartless. But as the story progresses, Natalie and Ash keep finding themselves in each other's paths. There is the physical connection, but slowly, they develop feelings for each other. It feels kind of sudden, kind of insta-love-y, but this is addressed throughout the book. The two of them keep wondering, do we really know each other? What would we do for each other? By the end of the book, they know just how far they would go for each other. But I was saying that the first half of the book is deceptive. It is. It's not just about Ash and Natalie's relationship (initially, lack thereof). Richards sets up the scene perfectly. The world-building is flawless. Every encounter, every event, every plot twist, gives readers more insight into the world, the city, the attitudes of humans, of Darklings, and so on. 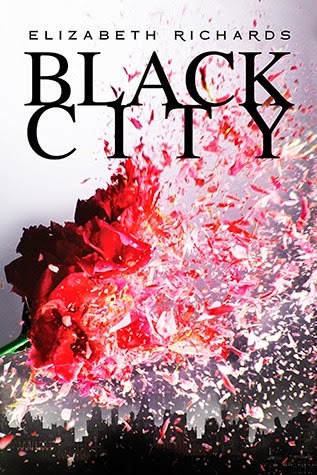 The first half of the book has readers following Ash and Natalie's relationship, but if you read beyond that, you'll see that Richards is subtly painting the picture of Black City, a divided stronghold of humans and exiled Darklings. I am a HUGE FAN of Ash. I love his strong, selfless personality. He didn't get Beetle hooked on Haze - he's helping Beetle wean off the Haze. He saved Natalie more than once. He takes beatings and harsh treatment for being a Darkling, even though he's a twin-blood. He has a good heart (hearts?) and a strong characters. And yes, apparently he is QUITE good-looking, nothing wrong with that! I think I liked Natalie overall, but at times, she was hard to like. You can't really blame her, because she grew up very well-off, very privileged. She also grew up in the home of the Emissary, her mother. Obviously, Natalie is going to be obtuse and ignorant at times. But Natalie sees and knows enough to know better, which she does. She acts on her rebellious nature towards the end - but towards the end. This is interesting to see - that Natalie isn't a complete rebel from the beginning. Richards breaks her down slowly. That's a bit of a change, from what YA novels usually feature. I love the plot of this book. It's part romance, part feuding. The struggle between humans and Darklings is intense, and it's almost reminiscent of real-life history. The Darkling are physically different beings - not human at all - but that doesn't mean they are ALL dangerous or malicious. Yet there are all forced to live on the other side of the Wall. It's interesting to see how Ash's two sides collide and pull him in both directions. I can't wait to see how that works out in the next two books. Poor Ash. I remember WHILE reading the book, I thought the romance was kind of insta-love-y. And it is, ish. But the characters keep asking themselves, do we even know each other? Do we like each other, beyond the physical connection? For me, this was good enough to rectify the insta-love issue. By the end of the book, I'm convinced that Ash and Natalie really do care for each other. So there's that. Also WHILE reading the book, I remember thinking, why does Natalie has ZERO backbone? She's quite spineless at times, it's sad. It made it a little difficult to like her. However, by the end of the book, I think her character developed pretty well, so I forgive her. Mostly. I most certainly would! I had a feeling that I would enjoy this book, and so I'm pleased that I liked it a lot. It's not straight-up dystopia like I thought it would be - and you all know I'm sick of dystopia, so that worked out really nicely. I love the paranormal aspect of this book - it's almost science-fiction-like. And the romance is intriguing, to say the least. So, there is something for everyone! It makes a nice combination, as a whole. Seriously, I think this book is a hit! 4 stars. Why didn't I read this one sooner?! I'm kind of ashamed of myself. I have wonderfully high hopes for Phoenix, and Wings! Aww, I hope you read both soon! I have ARCs of this trilogy (which is kind of awesome), so that's why I'm reading them now. Thank you so much, lady! I'm glad you enjoyed this! I've heard really mixed things, but it sounds like an interesting spin on vampires. I may have to read it some time this year! Shame that the main character was so spineless, though. That always bothers me. Ooo, yes, at first, I thought this was just another vampire book. But no, it surprised me! And Natalie shaped up, in the end, but throughout the book, she was a challenge to follow. Hmm...the insta-love and spineless moments and I might not get along, but the fantasy world sounds pretty cool. We'll stick this one in the maybe pile. Thanks for the great review! Remember what I said though - as I was reading, these things bothered me, but by the end, they kind of resolved themselves! Awesome review Alyssa I am so glad and happy you enjoyed this one this book has been on my radar for quite some time now and I haven't heard a lot about it but it looks and sounds fantastic plus it is fantasy count me in! thanks for sharing Alyssa! I hope you do read it at some point, Katiria! I foresee myself really enjoying this series - cross your fingers! You're very welcome, and thank you! I'm kind of the same, this has been sitting on my shelf for about six months and despite the awesome reviews, I just haven't managed to pick it up. Great review though and I hope to read it soon! There is no time like the present! Or so I'm telling myself. Thank you, Zareena!